You can even show it a few inches away from your spectators. A useful magic prop that, can be used in many different ways. A total realistic and contemporary look! The full bottle is amazing and will definitely be on your shows, a perfect compliment for the HALF and CLEAR version. 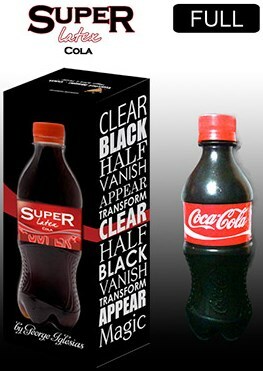 Show a bottle full of cola and vanish it in front of your audience! Inflate a ballon, then grab a needle and by popping the ballon make a bottle full of cola appear! Multiply bottles and many more! It compress 10 times their original size! George asks: When compressed. Will the label withstand hundreds of shows. 1. AmazeKids responds: We haven't tested that so can't confirm. But the labels are easy to replace.